This is partly due to people thinking that speed/agility/conditioning/quickness is only about lower body work, which is a lie. 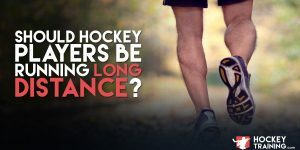 But it’s also partly due to some strength and conditioning coaches making crazy claims that upper body work isn’t “functional” for hockey player – which if you know anything about sports physiology you know that is complete nonsense. Upper body training can and should have its place within your periodization year-round. *The three groupings of exercises with numbers next to them represents supersets. With the supersets you will perform the first exercise, rest for the given time before moving onto the 2nd exercise, and then repeat for the provided sets. The incline close grip bench press is an exercise that very effectively targets the chest and triceps which are muscles that aid hockey athletes tremendously when winning battles in the corner or when trying to stand your ground in front of the net. As an added bonus, this particular version of pressing is very easy on the shoulder joint, which in many cases can be a great thing for hockey athletes as they very commonly have nagging shoulder injuries/pains and feel pain when doing movements such as the flat barbell bench press. The barbell row is the king of all back exercises, although it should be considered a total body exercise in its own right. Doing a barbell row with proper technique will train your upper back, mid-back, lower back, hips, arms, grip, and core. This exercise is one of the best assistance exercises you can do to improve your bench press, squat, and deadlift — which all have significant carryover to your on-ice functional outputs. The face pull is an exercise that very effectively trains the upper back, deltoids, rotator cuff, traps, and rhomboids. One of the biggest benefits of performing rope face pulls in that it balances your upper body out both structurally and from a strength perspective. You see, a lot of athletes do way more pressing than they do face pulls, because of this, they create a structural imbalance in their upper body which first leads to shoulder pain, and then eventually to injury. Face pulls help prevent that from happening while simultaneously improving your shot power and performance in your other lifts in the gym that require a strong upper back (which is a lot of them). The incline neutral grip dumbbell bench press is a movement that is very similar in muscle fiber activation and hockey-specific benefits as the incline close grip barbell bench press, just with a little less triceps activation and a little more chest activation. One thing that’s important for you hockey players out there to remember if you have shoulder issues is that taking on the “neutral grip” (some coaches call this the “hammer grip”) position when doing your pressing is much easier on your shoulders. So, instead of doing standard DB incline bench press or DB shoulder press, opting for doing these movements with a neutral grip will be a much better option for you right now. But, if you don’t have any shoulder issues, no need to make the switch. If you had to ask me to pick one exercise that would improve a hockey athletes shot power the most, I would say it’s the pull up variations. I have talked about it in the past plenty of times, most notably here and here. Wide grip pronated pull ups, chin ups, towel pull ups, and in today’s workout…the close grip pronated pull up. I like this exercise because it very effectively targets the mid-back, lats, and upper back… but is also extremely difficult for your grip, forearms, and biceps. The reason I used this variation here is that there is no direct biceps work in this workout (you can only ever perform so much volume in any one given workout), but this exercise makes up for that in a big way. So with this exercise, we are getting more back work in to stay strong on the puck and do the best thing possible to improve our shot power, but we are also getting a 2-for-1 deal because we are getting our arm workout at the same time. The dumbbell cobra is an advanced external rotator cuff movement, I don’t typically recommend this one for beginners as it is difficult from both a coordination and strength perspective when you get it right. Hockey athletes maintain a life almost exclusively spent in flexion (internally rotated shoulders, bent over at the hips, etc.) and need an intelligent approach to structurally balance them out if career longevity and optimal performance is something they desire. The dumbbell cobra is an excellent structural balance exercise to prevent injury but also goes a long way towards improving both shot power and shot accuracy due to creating a balance rotator cuff. The plank is one of the best core exercises in the game, and the role of the core in your hockey performance is something you can’t ignore. Power is created in the ground, transmitted through the core, and expressed through your extremities. If you have no core, it doesn’t matter how strong your legs, hips, and upper body are because your transmission will be dialed down to match what your core can handle. The body does this as a protective mechanism for your spine, if your legs are capable of producing 10 units of force, but your core can only produce 6, then your nervous system will weaken your legs in the kinetic chain so that you do not injure the spinal cord in your athletic movement (protecting the spine is the cores primary job, performance always comes second). By keeping our core strong, we keep everything strong. I like to throw it at the end of a workout because if we do core first it pre-exhausts you from performing well in very core-dependent movements such as the barbell row and pull up. The above workout is an example workout that would be most appropriate for an experienced hockey training athlete who is at least 16 years of age or older (due to the prescription of heavy sets going as low as three reps). A 12-15 year old youth player can still perform all of these exercises, but they would be altered in volume and intensity to meet the appropriate demands of their training age and needs analysis. And for the even younger youth athletes out there (ages 8-12), it’s best they stick to bodyweight only training that has a greater focus on total body work rather than just upper body — like the workout you can see here. The above is an example upper body hockey workout that I would use with athletes in the off-season. 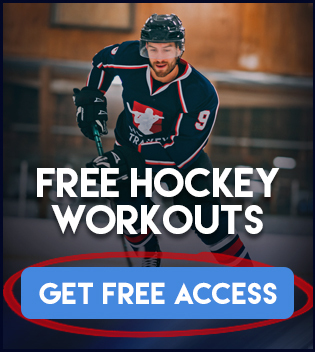 This is also just a tip of the iceberg as to what type of thinking goes into upper body training for hockey athletes and only one workout that would ideally be used in a 4-Week training phase. So, although this is an example workout that you can do, it’s imperative that you have a full program structure in order to get the best results possible. 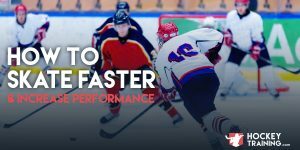 To learn more about what a FULL hockey training program should look like during all times of the year and get access to the widest selection of hockey training programs and performance nutrition advice in the world — check out the VIP program. Off-season workouts are different than in-season workouts in many ways beyond just the reps-in-reserve (periodization, performance-needs, goal of the phase, recovery capacity, etc.). For these reasons I really don’t recommend doing this one during the season.